Here we have another whisky from the excellent Bruichladdich distillery on Islay, but you might note that we have spelt their name incorrectly on the label - we have written it as “Port Charlotte”. Ah, you see, that is because Bruichladdich use the Port Charlotte name for whisky they have produced using heavily peated barley (though not super-extreme-silly levels of peat - thats their Octomore bottlings). 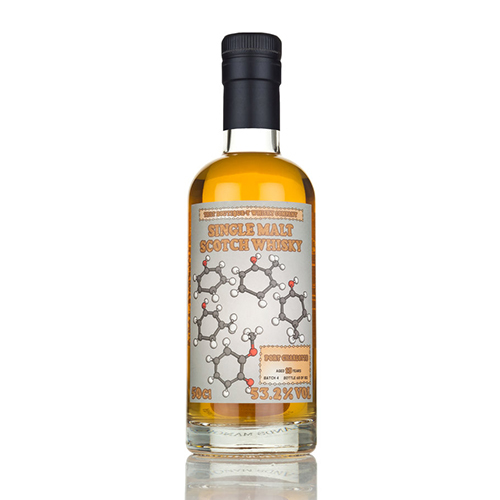 As such, we have given centre stage to the 5 molecules that produce the phenolic compounds in peated whisky. Nose: Get a whiff of that roaring open fire, coal tar and prickles of cedar wood and rosemary. Palate: Initially sweet with hints of cocoa, black cherries and treacle. Then come the herbs, oregano for sure and a cardamom touch. Finish: A long, smoky finish with lasting flavours of leather and tobacco.